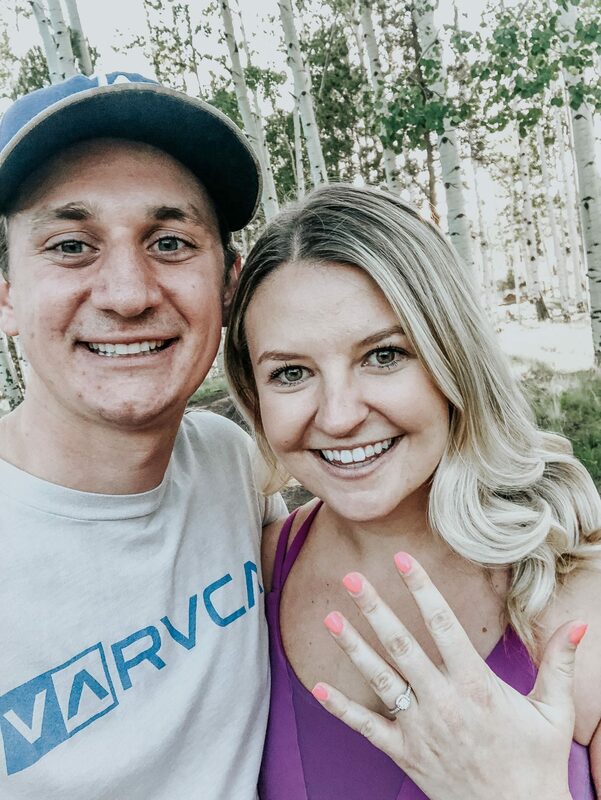 As some of you may know, Charlie and I met at Northern Arizona University in Flagstaff in 2015. We were introduced to each other by my roommate and mutual friend at a bar one night and instantly had a connection. Sorry to call you out Charlie, but I am, it took him three full months to text me after giving him my number that night. We started texting and hanging out in December of 2015 and became an exclusive couple at the end of January. Charlie took me on our first date the weekend after he came to my sorority date party with me in February and it didn’t even feel like a first date because we were so comfortable being with one another. I remember telling my friends how much I liked him and how I could see myself being with him for a long time very early on in our relationship. We went on a spontaneous trip to New York City and Boston for his birthday and after going on that trip together, I knew I was going to spend the rest of my life with him. 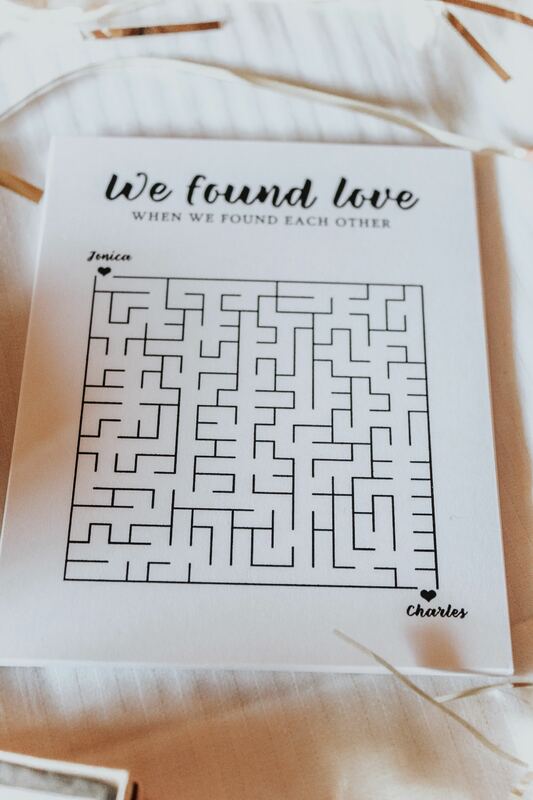 I hate to admit it, but I totally knew Charlie was going to propose when he did. I know him so well and know when he is being different and he was totally off that day. He is usually so easy going and isn’t ever pushy about what we do, but he was that day. He insisted we go hiking on Saturday, but it rained all day long so we couldn’t go. On Sunday afternoon, he again insisted we go hiking and I knew something was up because he usually would have just said we could go another weekend instead. 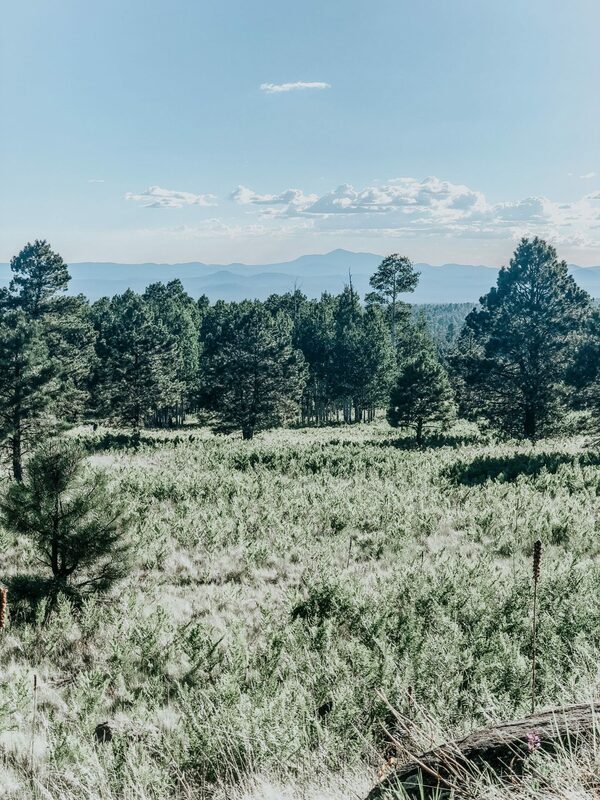 We went up to Snowbowl in Flagstaff and went on the most beautiful hike. It was so peaceful and quiet and it seemed like all of nature knew what was about to happen. Charlie brought a blanket to sit on and snacks for us to eat while we sat at one of the overlooks. After looking at the beautiful view for awhile and eating our snacks, we continued our hike. We got to my favorite spot on the hike and were taking pictures of the amazing Aspen trees and I had Charlie take a few pictures of me (for the blog of course). He told me to turn around and put my hands up so he could take a picture. 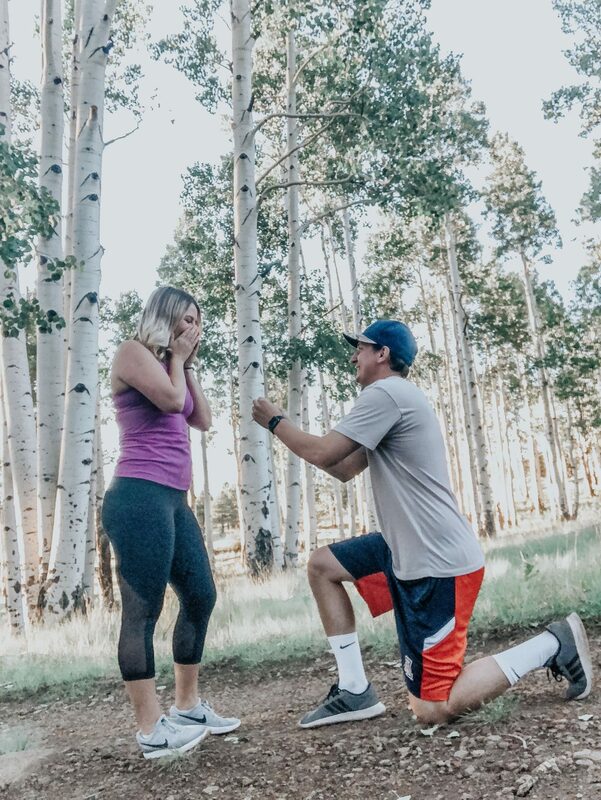 When I turned back around, he got down on one knee and asked me to marry him! Even though I had a feeling it would happen that day, I was so surprised and excited. 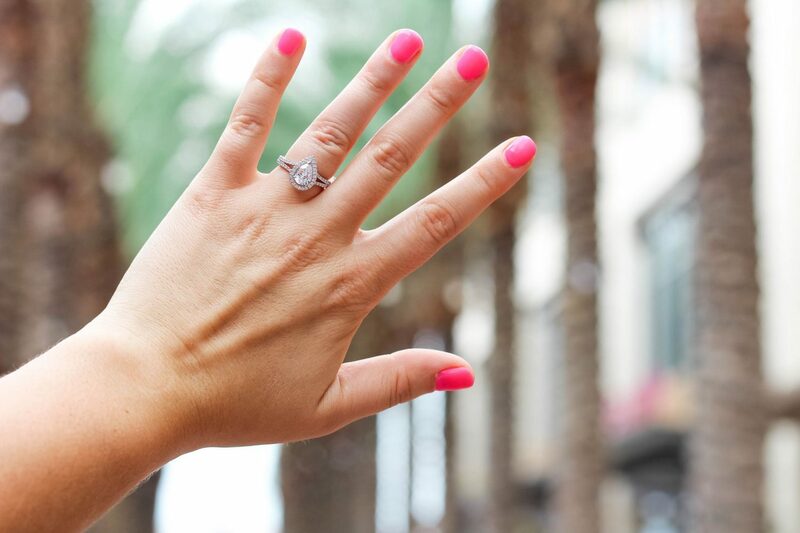 He picked out the most beautiful ring all on his own and had it customized! I still can’t believe we are actually engaged, I can’t wait to spend the rest of my life with the man of my dreams. Stay tuned for more wedding content! I will be sharing all of the dresses I tried on from Stella York at Bella Lily Bridal at the end of the week. 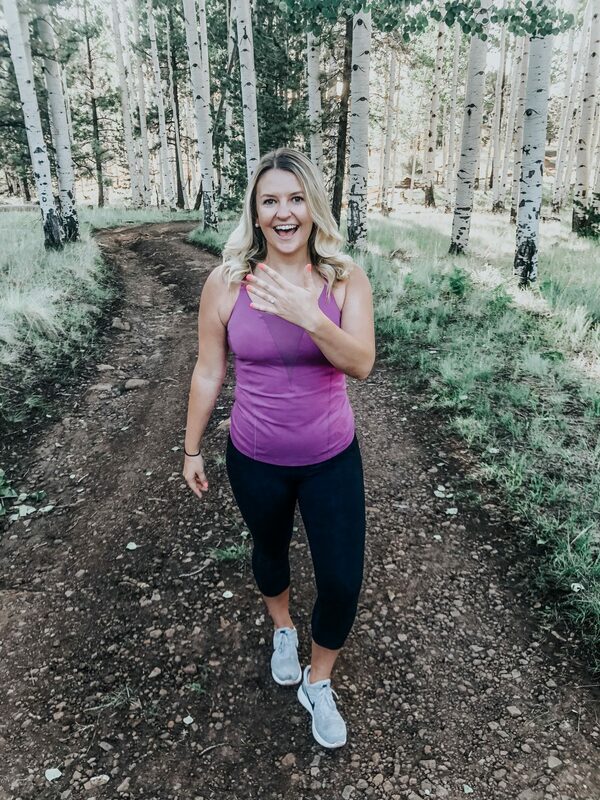 I have been waiting for the past month to ask my maid of honor and bridesmaids to be in our wedding and the suspense has been killing me! I finished my maid of honor’s gift box the weekend of my birthday and had planned on giving it to her that weekend, but decided it would be best to wait until the dress fittings and engagement party, when I was giving others their gifts as well. 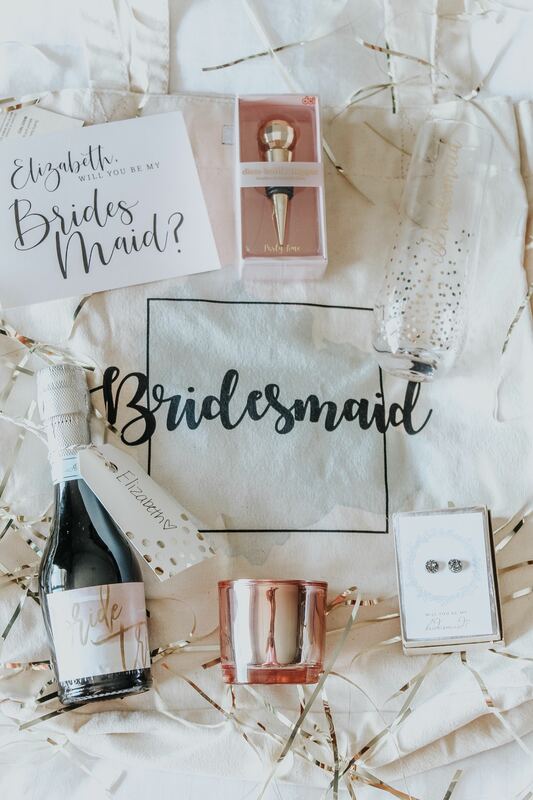 I am also happy that I waited because two amazing brands reached out to me about collaborating for bridesmaids gifts and I absolutely love both brands! The first brand is a cute little boutique in Glendale, California called Shop Days of June. 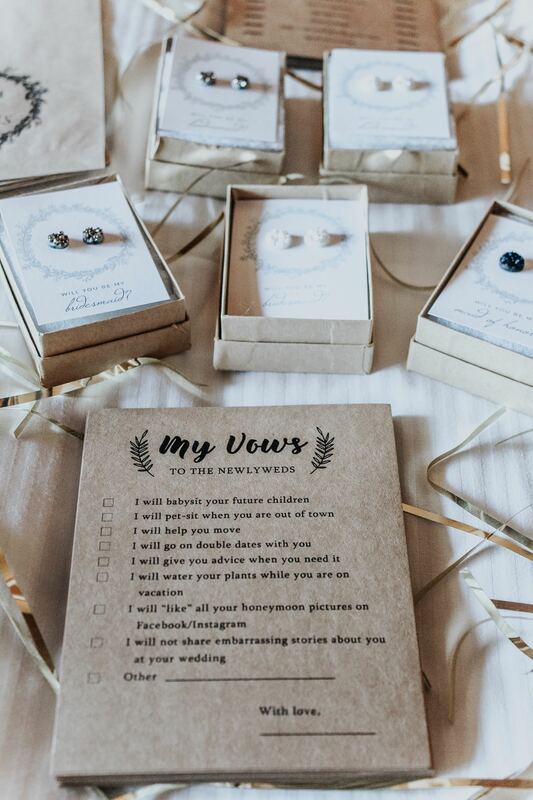 Shop Days of June makes the cutest, affordable rings, bridesmaid gifts, and wedding games/favors. 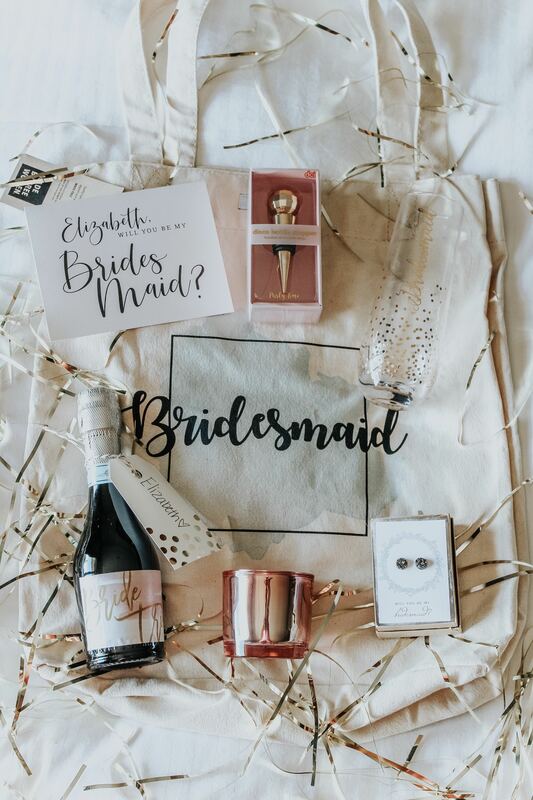 Shop Days of June sent me all of the earrings for my bridesmaids and maid of honor, the customized wedding favor bags with our names and wedding date, and customized wedding games for my bridal shower. Everything they sent me is so so cute and made with amazing quality. 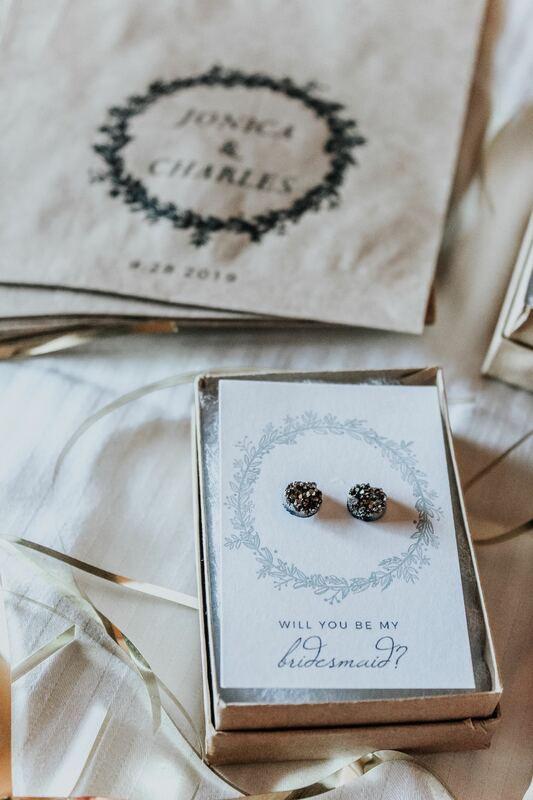 All of my bridesmaids loved their earrings and I can’t wait for everyone to play the games at the bridal shower. 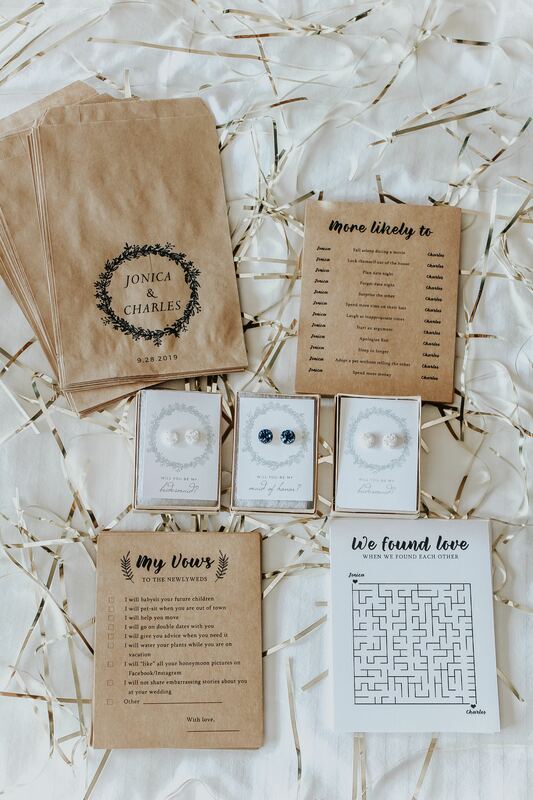 A huge thank you to Shop Days of June for all of the bridesmaid gifts, wedding favor bags, and wedding games! 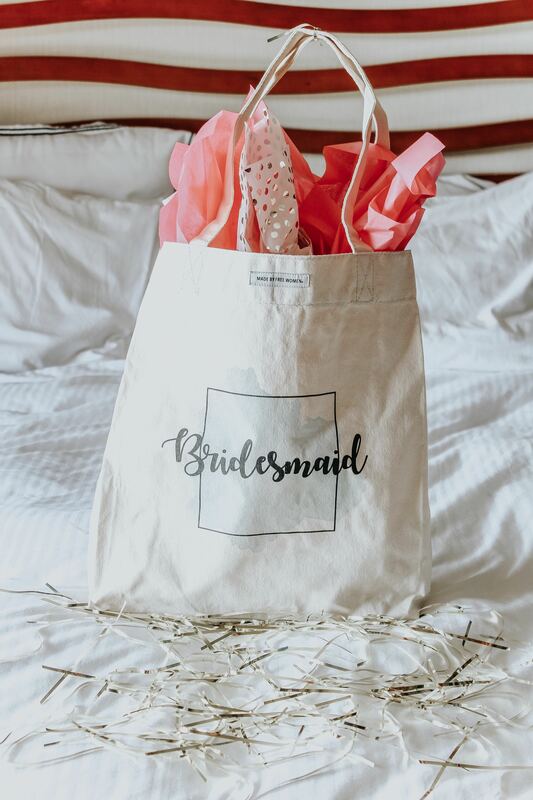 The second brand that contacted me was Causegear and they just released the cutest bridesmaid totes! 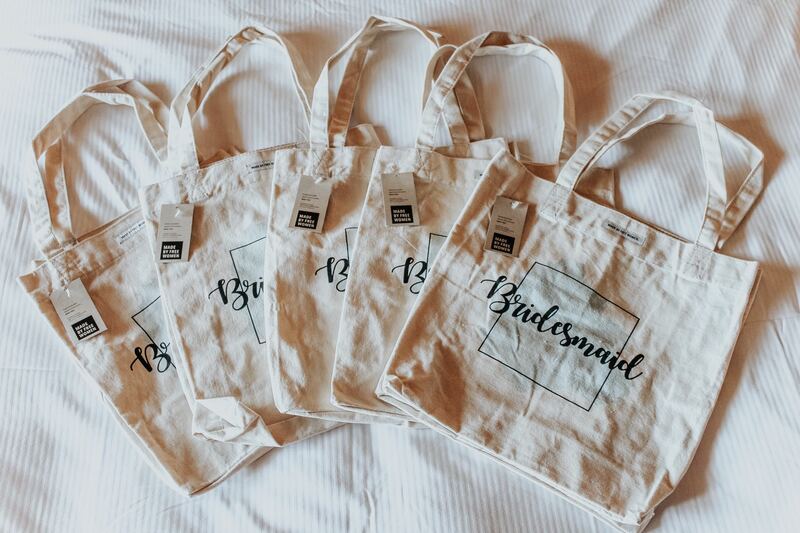 I had originally planned on just using cute paper bags that said bridesmaid on the side, but thought it was such a fun idea to collaborate with Causegear and give my bridesmaids all of their gifts in a reusabale tote. 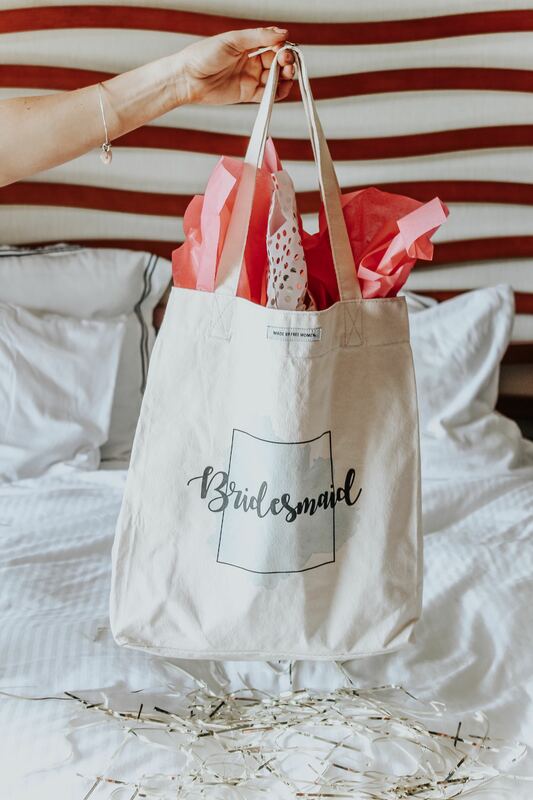 They will be able to bring the tote to the bachelorette party, use it for the wedding, and for grocery shopping after the wedding festivities are over. 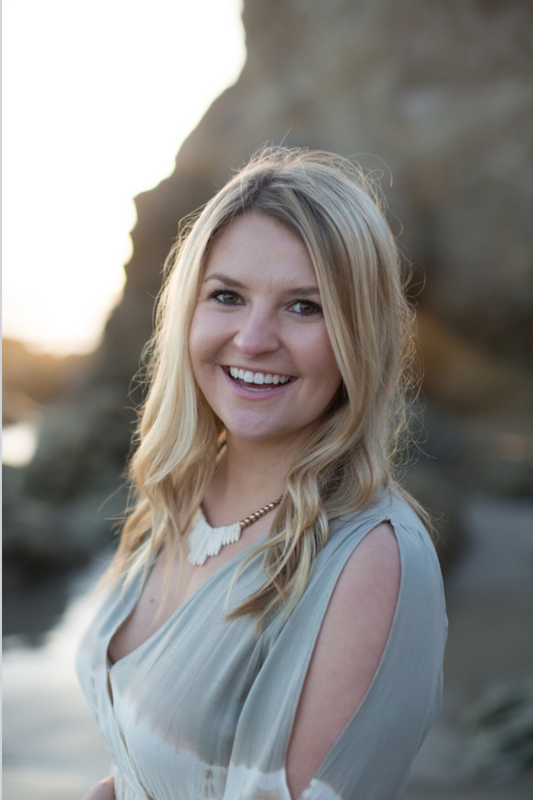 Causegear is an amazing company that supports women in so many wonderful ways. 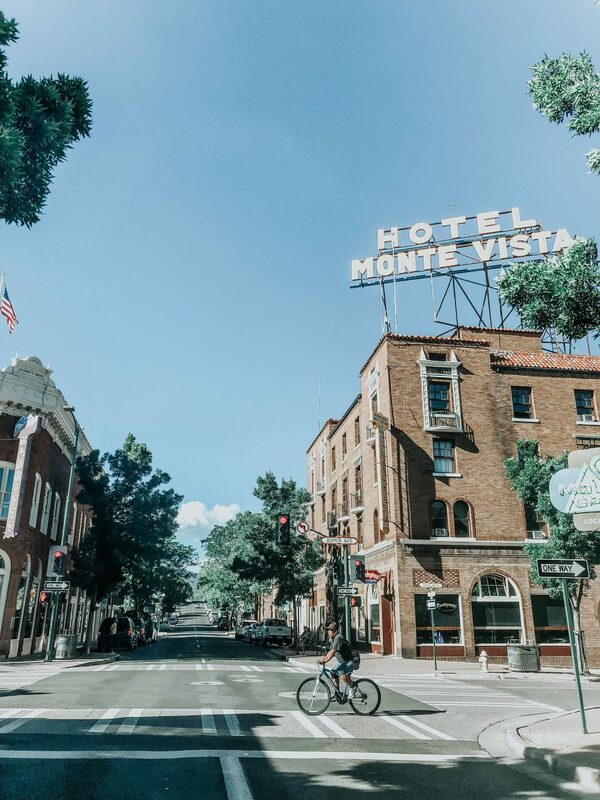 Click here to read their mission, it’s worth the read and will make you want to purchase a tote because it is so powerful. Thank you to Causegear for sponsoring all of the cute bridesmaid totes! 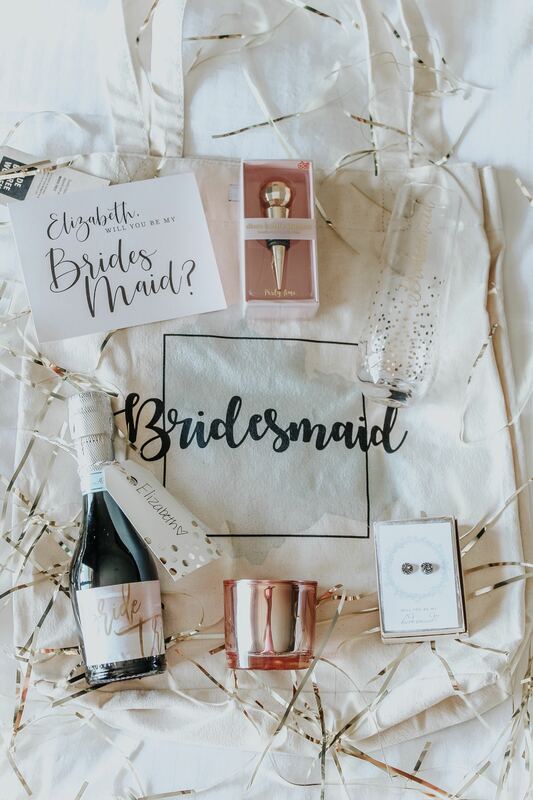 In all of the bridesmaid totes, I gifted all of my bridesmaids with a proposal card that was personalized with their name and had a handwritten message on the inside, disco bottle toppers from Nordstrom Rack, mini candles from Nordstrom Rack, earrings from Shop Days of June, a champagne flute from Marshalls, La Marca prosecco with a Bride Tribe label, and the tote from Causegear. I also decorated each bag with confetti and cute tissue paper. For the maid of honor gift box, the only things I changed was that I put everything in a gift box that said will you be my maid of honor on the front, the earrings from Shop Days of June were personalized for the maid of honor and were the only earrings that were blue, instead of silver or white. 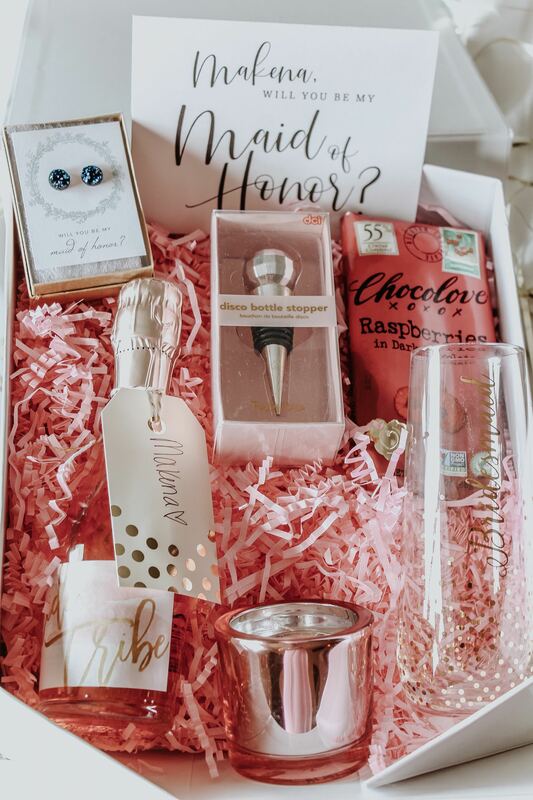 I also added a maid of honor champagne flute, but it didn’t get shipped in time so I will give it to her at a later date, and also added a raspberry chocolate bar. I will be hosting a giveaway with Causegear this week on my Instagram page and it will be very easy to enter so don’t miss out! Keep checking my Instagram page to follow the steps and enter to win. 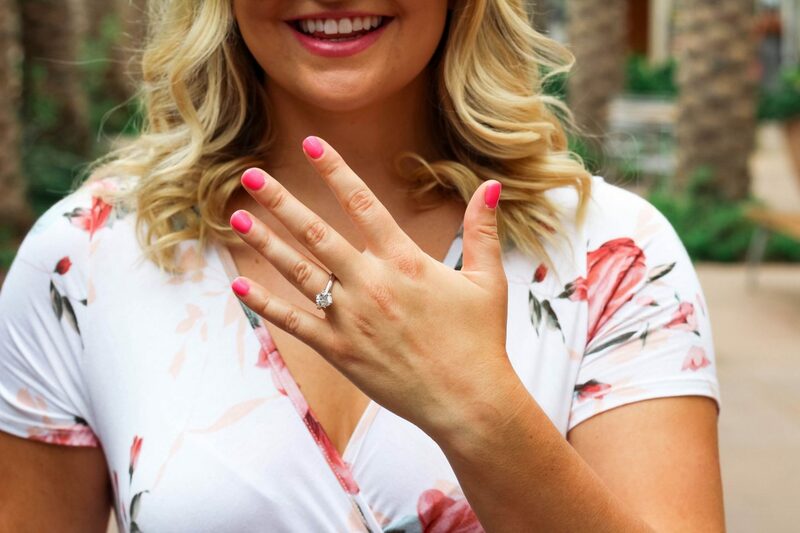 I hope you all enjoyed seeing and reading about how I asked my maid of honor and my bridesmaids to be in our wedding! If you have been following me for awhile, you know that I have been trying so hard to grow my hair out and it hasn’t been working out for me. 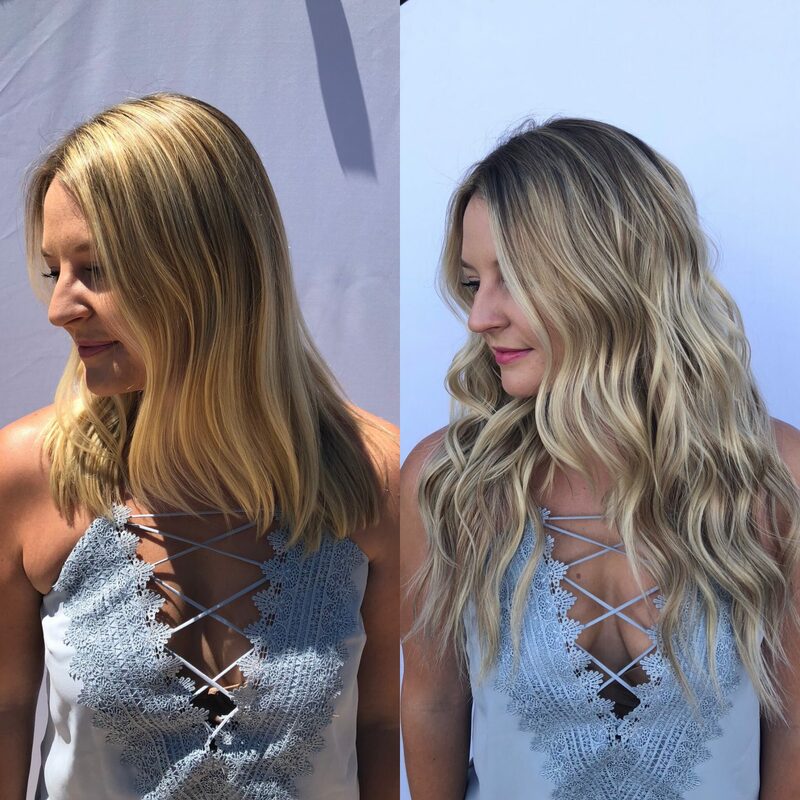 I have been looking into extensions for such a long time and have been doing so much research on all of the best extensions, etc. 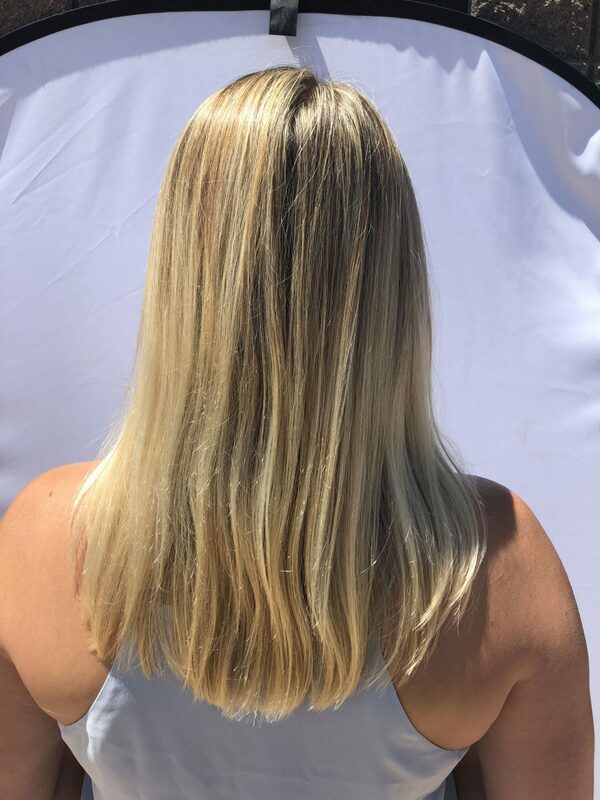 I had heard that extensions can be really damaging to your hair if you get the glue-in extensions, tape-in extensions, or any other extensions that rip out your hair over time, which is why I was so skeptical at first. 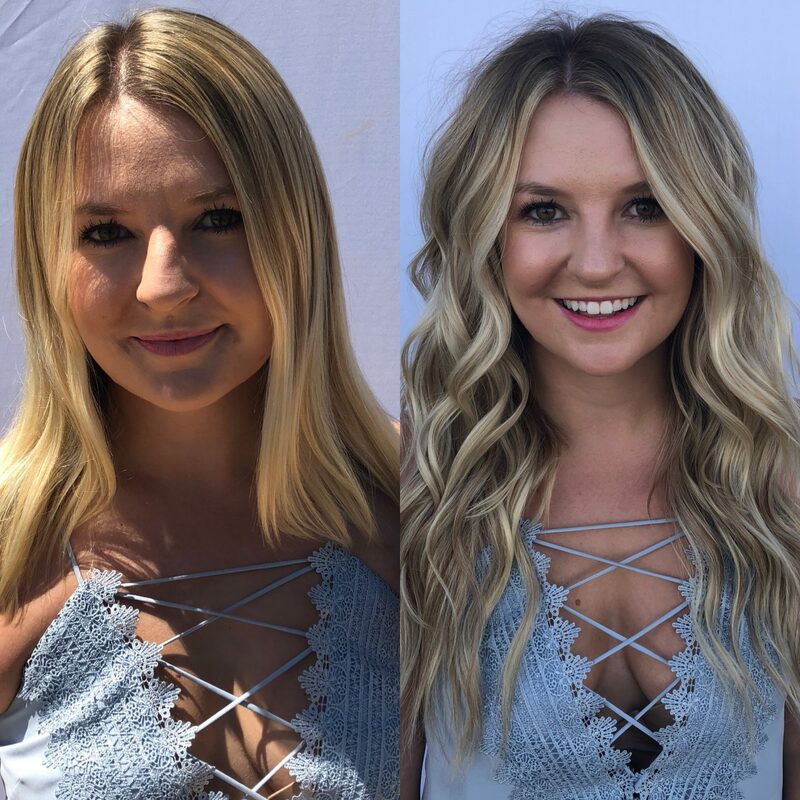 Shelby reached out to me and she is a certified NBR stylist (NBR stands for Natural Beaded Rows), I looked at her work on her Instagram page and instantly new I wanted to do it. 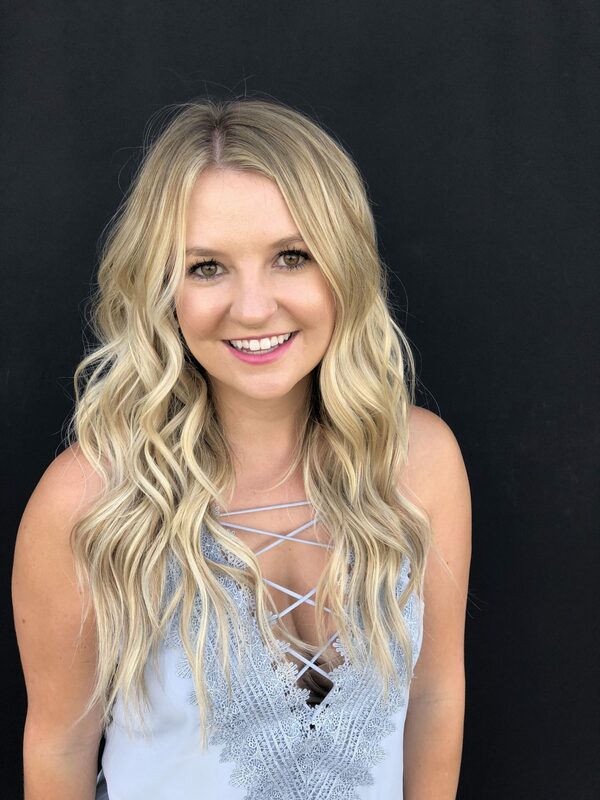 I want to first start off by saying how AMAZING Shelby is as a person and a stylist. I spent around three and half hours, including taking pictures with her and we had way too much fun. I didn’t even know I had been at the salon for three hours because we had so much fun laughing and talking. Shelby explained NBR and the entire process to me before she started putting them in my hair so I knew what to expect up front. She also did such an amazing job of explaining everything to me as we went so I could follow along. 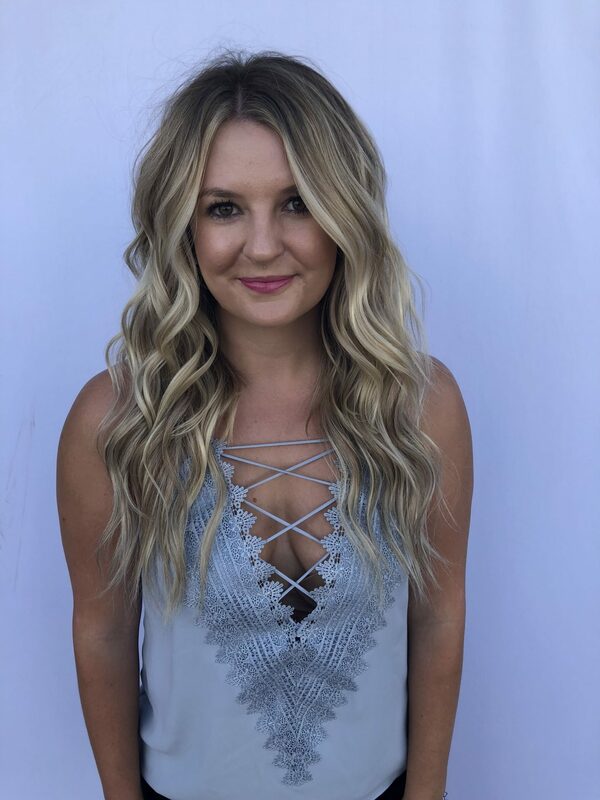 She is seriously such a talented stylist and I am definitely making her my new go-to girl for hair! 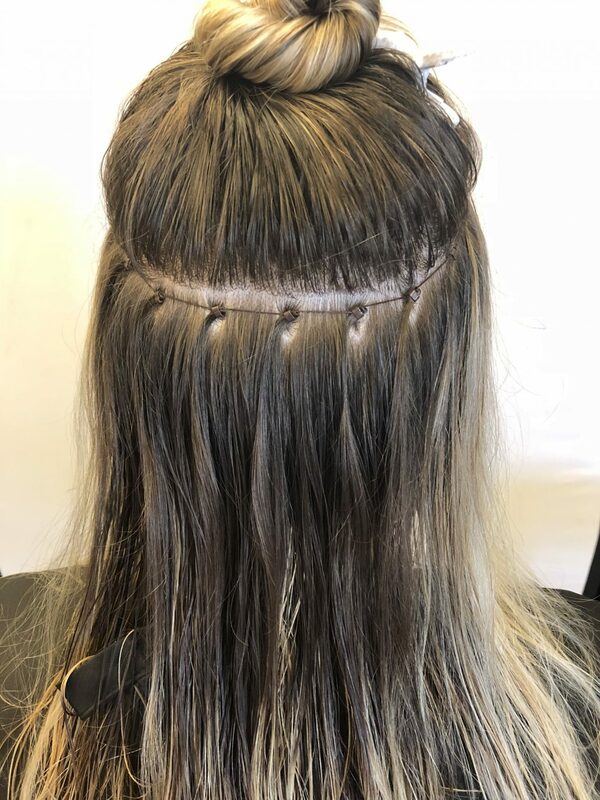 As I mentioned before, NBR is so much better than doing tape-in, glue-in, or other extension methods because the hair is placed on a “track,” Shelby calls it “hair braces,” which I love because it’s so true and easy to understand when you think of it that way. This track prevents the extensions from ripping out your natural hair when you take them out. 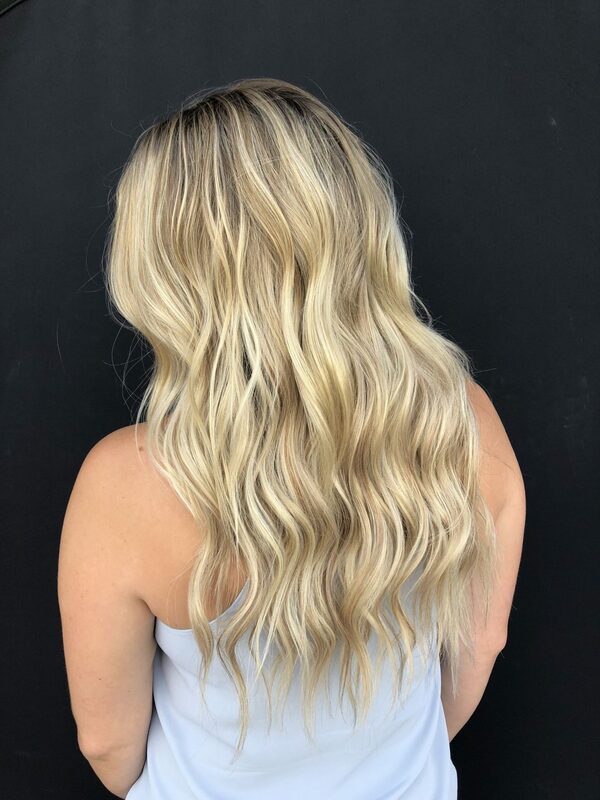 The NBR extensions are also so natural looking, which is a must when getting extensions. You don’t want anyone to be able to see clip ins or wefts when they look at your hair. I also love how lightweight they are in my head. Even though I got a full head of extensions put in my hair, it doesn’t feel as heavy as I thought it would, yet my hair looks so full. The NBR extensions are put on the track and then sewed onto the track, which prevents them from slipping out. You can throw your hair up in a pony tail and the extensions won’t slip out and you won’t see the wefts or the track so it’s a win-win! 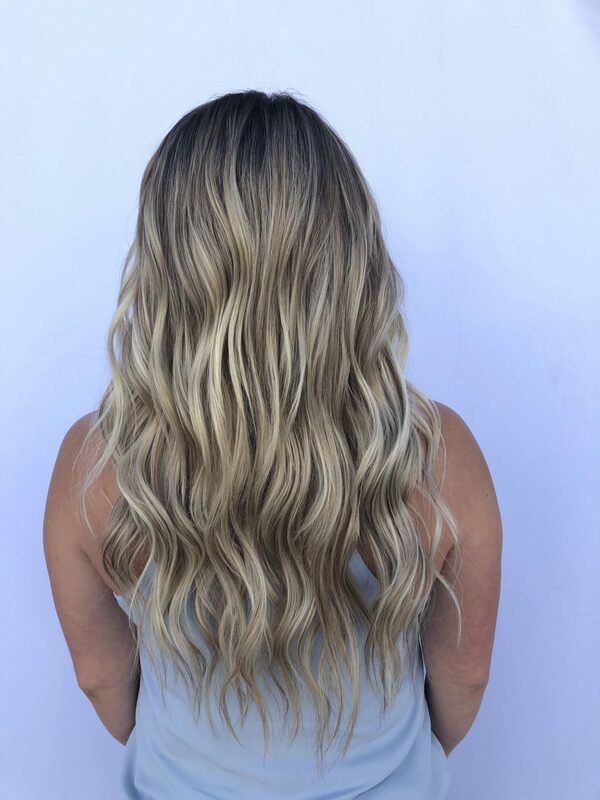 I honestly didn’t know what to expect before meeting with Shelby and getting the extensions put in my hair. I am beyond shocked at how the texture of the extensions feel compared to my natural hair because it feels the exact SAME! I still can’t believe how natural and real my hair feels, even though I have extensions in. Shelby did 2 rows of 6 wefts, which means I have 12 total. I was shocked at how fast the entire process took because I was expecting it to take double the amount of time that it actually did. 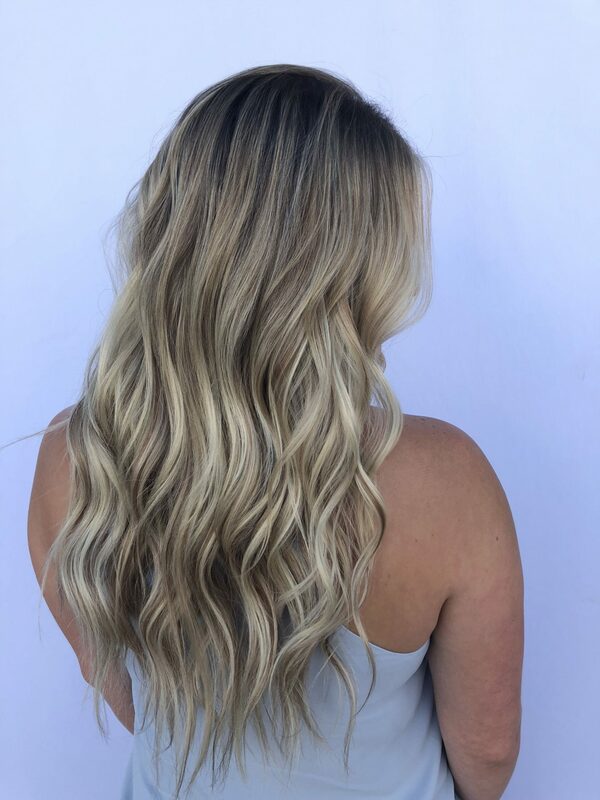 Shelby also did an amazing job of matching the extensions to my natural hair and only had to do about 10 foils in my hair total to make it look as natural as possible. She also did foils on the hair framing my face to brighten up the blonde around my face, which I absolutely love! 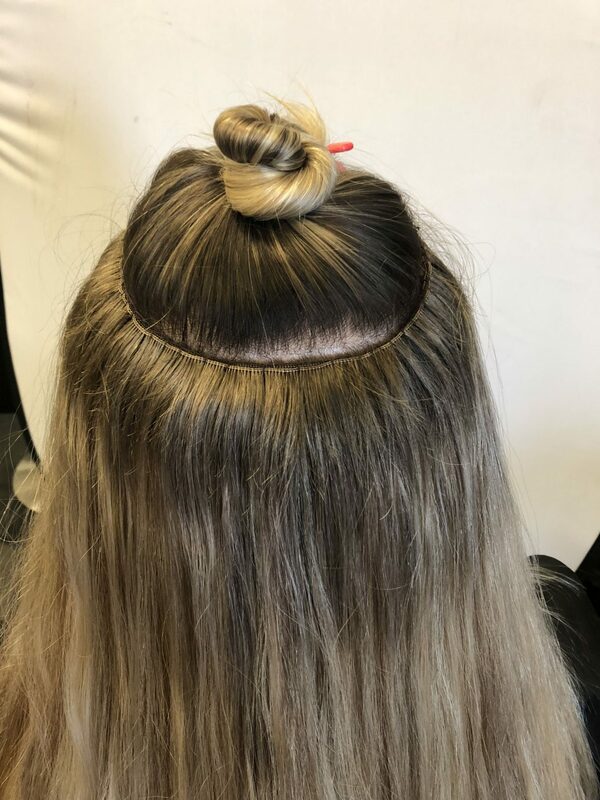 I was also shocked that it didn’t hurt to put the extensions in, at all. 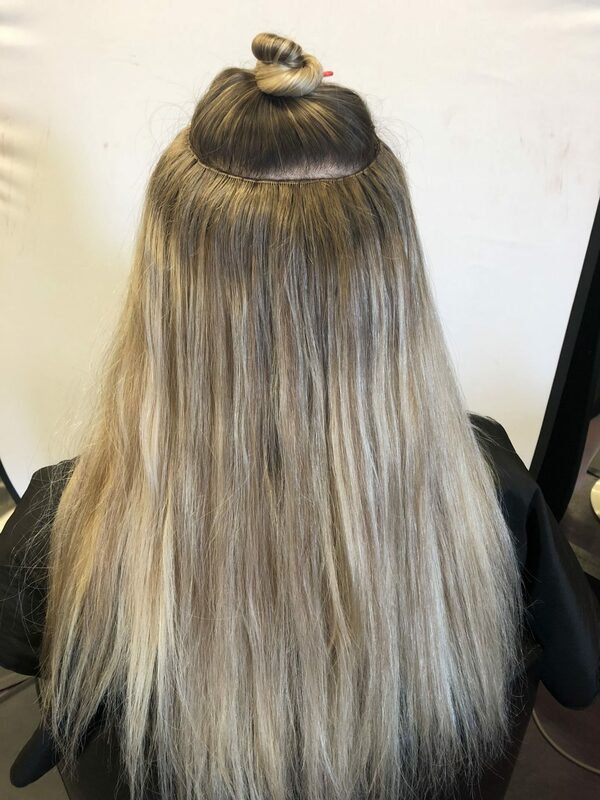 I was never in pain while she was putting the extensions in my hair, it just felt tight while she was putting them in and after I left for a couple of hours. I have already slept with them in and it didn’t hurt or feel uncomfortable to sleep in them, which I’m so happy about! I also know that people say they can be itchy for the first few days, but my head has not itched at all. 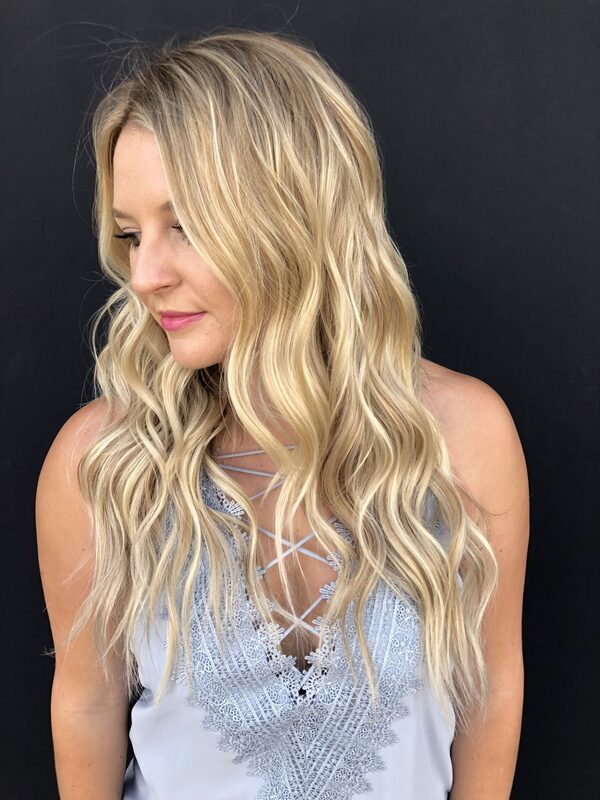 Another thing I absolutely love about NBR extensions is that you can 100% style your hair and put all of the products in the your hair that you usually use with your natural hair. I will be using the same shampoo and conditioner that I normally use on my natural hair. 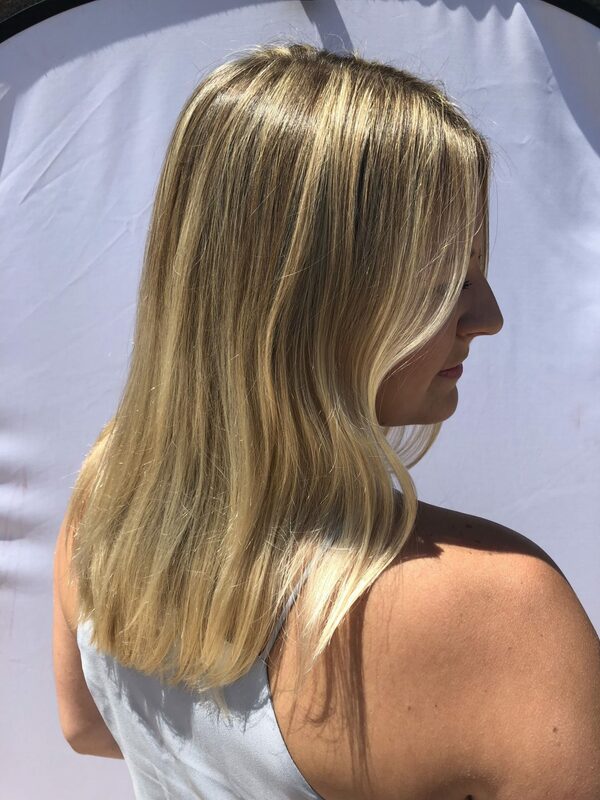 This shampoo is the best color extending shampoo on the market and it has worked so well with my natural hair so I plan on using it with my extensions as well. I also plan on on using my usual purple shampoo once a week to keep the cool tones in my hair and prevent it from turning gold. 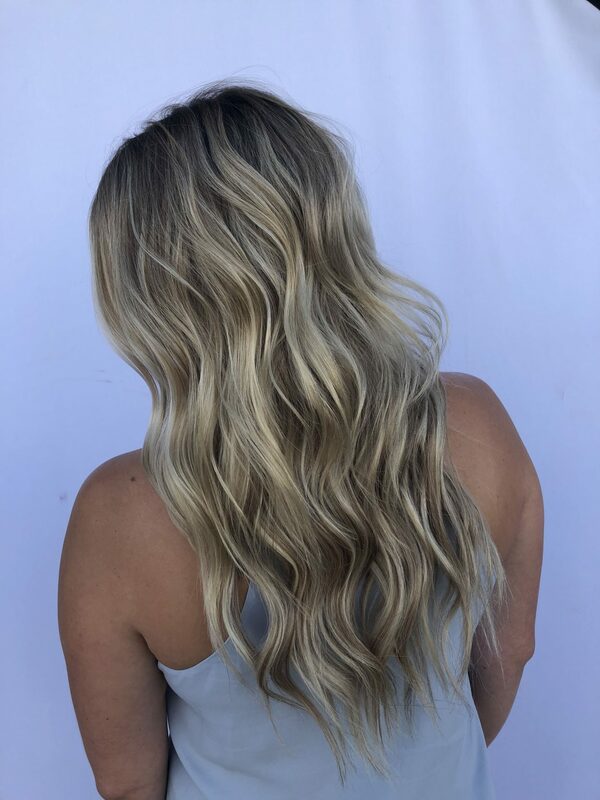 Shelby also recommended using hair oil to protect the extensions, which I just bought and will start putting in my hair every day or every other day. I also plan on getting the wefts moved up every 6-10 weeks, depending on how fast my natural hair grows. And yes, your natural hair still grows with the NBR extensions in, which is amazing! 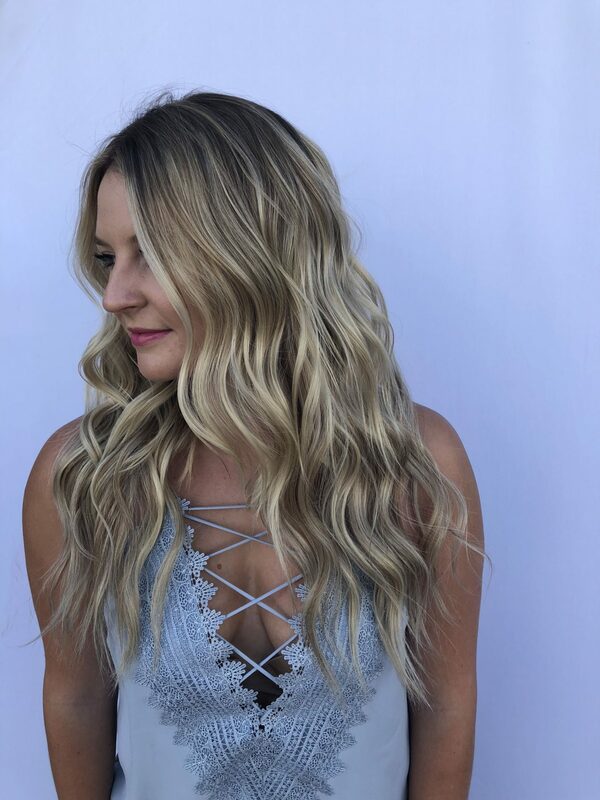 I will finish by saying that because NBR extensions are the best of the best and it costs NBR certified stylists a lot of time and money to learn how to do the technique, the extensions can be very costly. 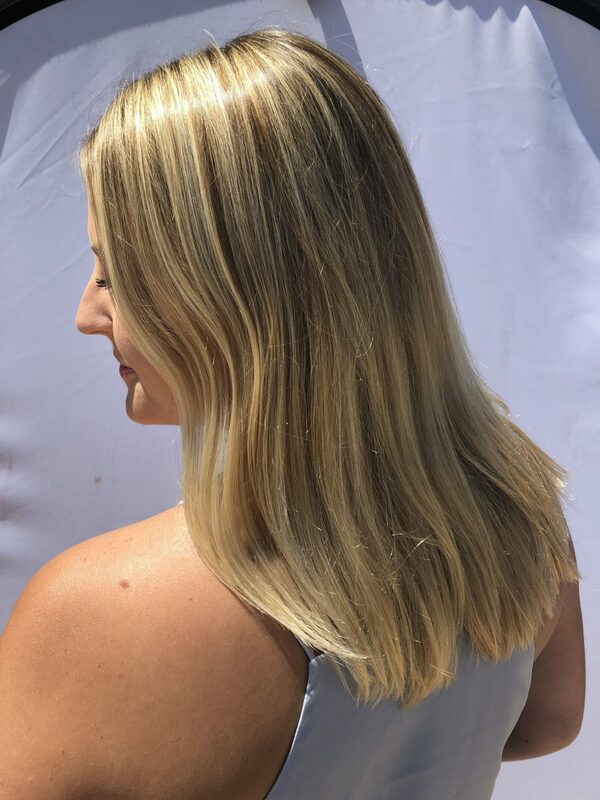 Not to mention, it takes a significant amount of time to match the color to make the extensions look natural and also takes time to insert the extensions. 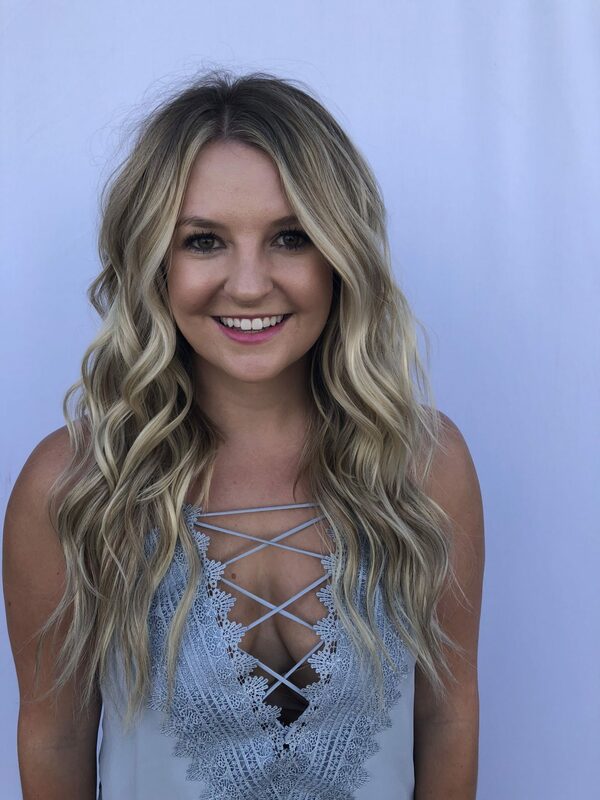 All extension appointments by Shelby require a consultation and she will go over the pricing and process with you. 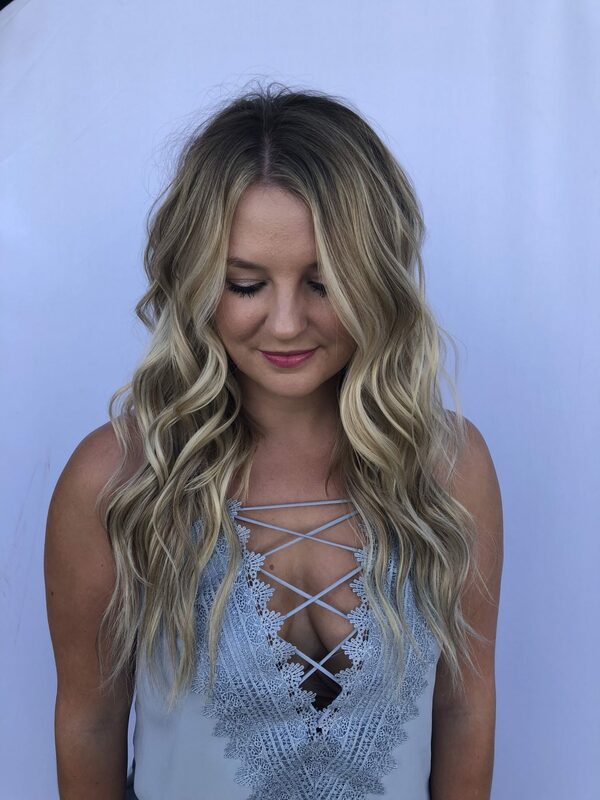 If you are interested, you can reach Shelby by calling Teal Monkey Salon at 623-640-0480. Now on to the fun part that you’ve all been waiting for, the amazing before and after pictures! I am absolutely in love with my hair and have never felt more confident about my hair than I do right now. 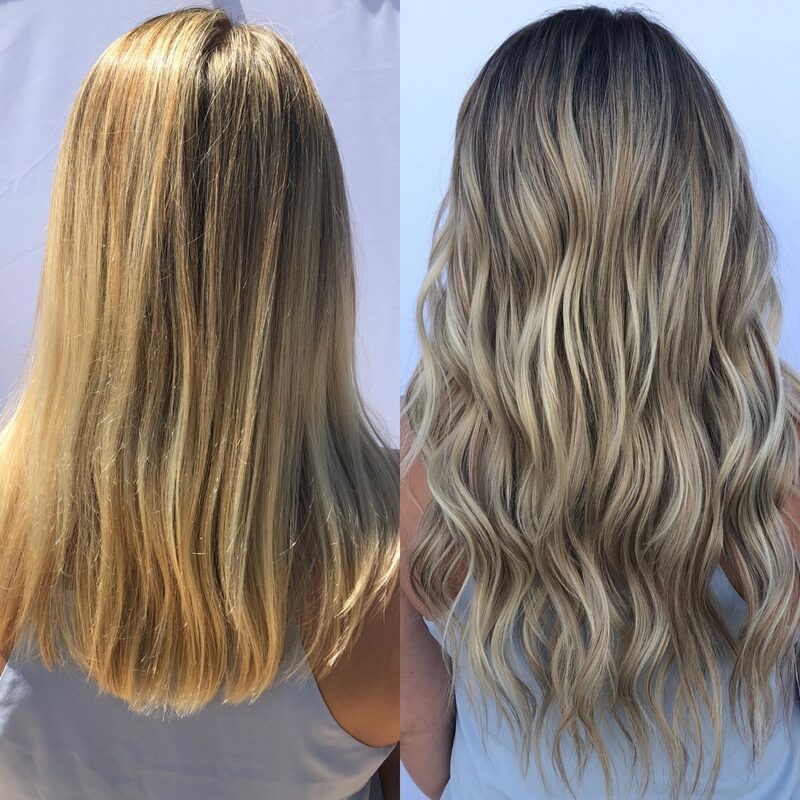 I highly recommend contacting Shelby about NBR extensions if you are truly interested! 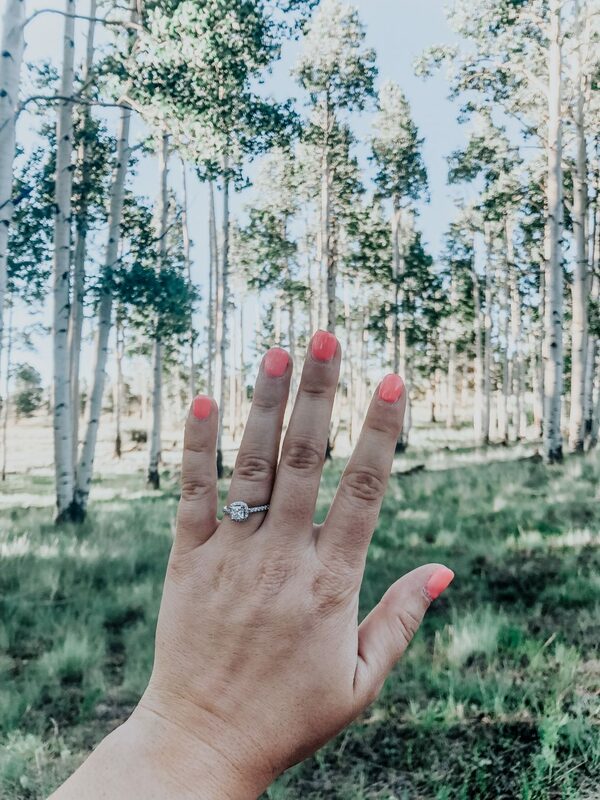 As you may or may not know, I just got engaged two weeks ago and I am beyond excited and happy! I have been dreaming about this moment since I was a little girl and it was an absolute dream. 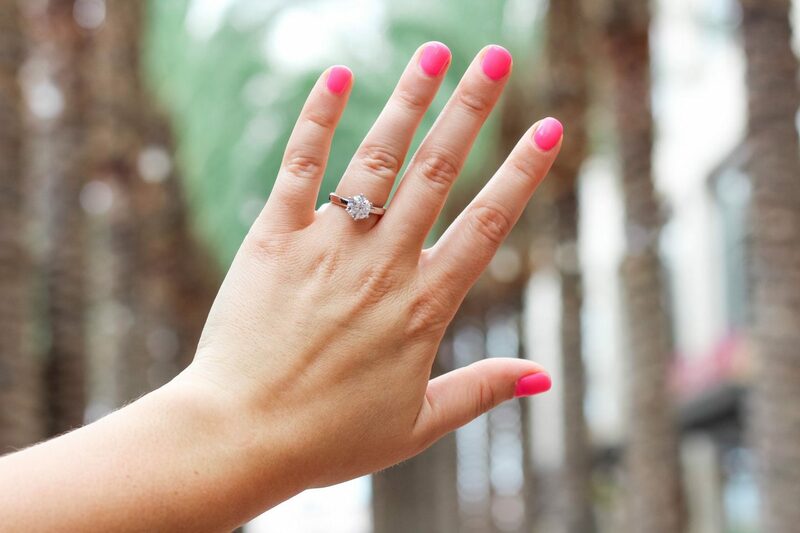 I will be sharing our engagement story on the blog soon so stay tuned. 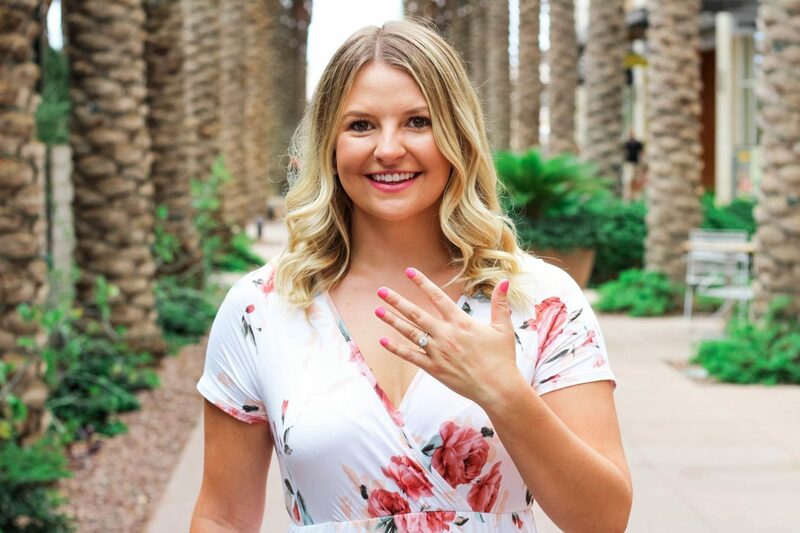 In the spirit of getting engaged recently, I wanted to share the top engagement ring trends and my top three favorite rings from Galicia Jewelers in Scottsdale. 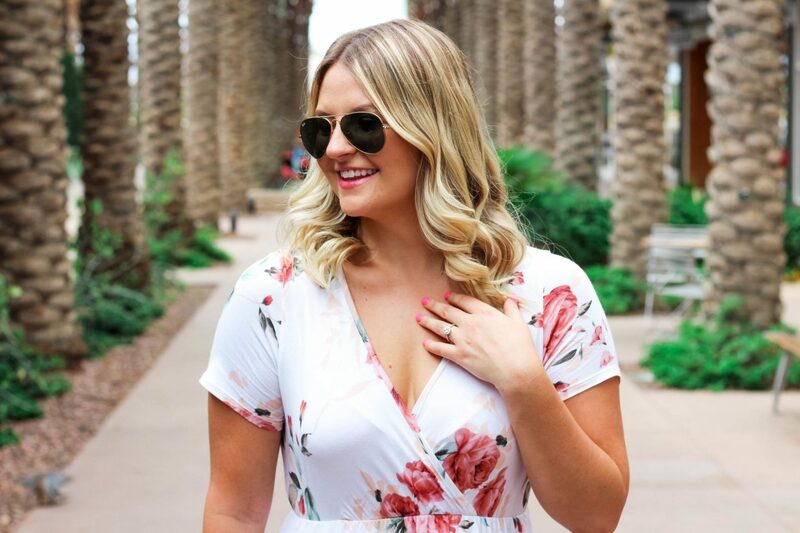 I will also be sharing two affordable summer pieces that I am absolutely loving and one of the pieces is on major sale right now! I also wanted to show you a couple of affordable pieces that caught my eye while I was shopping at Galicia Jewelers! 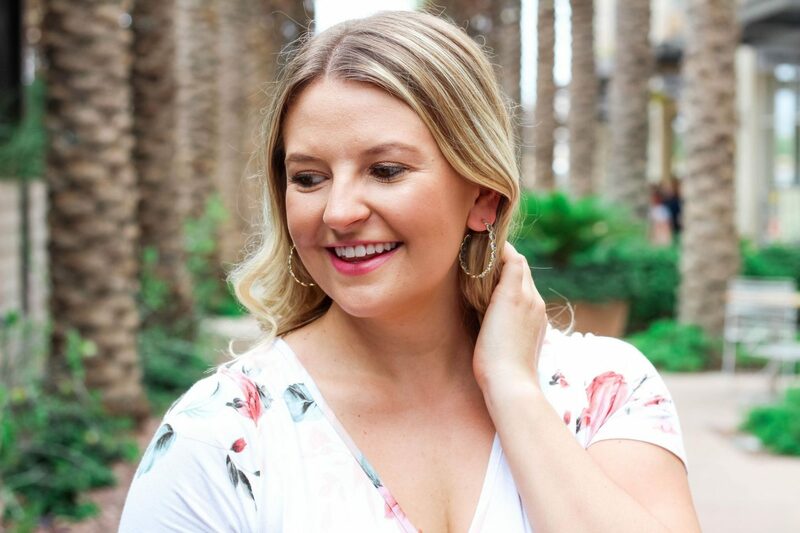 These earrings are so fun and the perfect summer accessory. 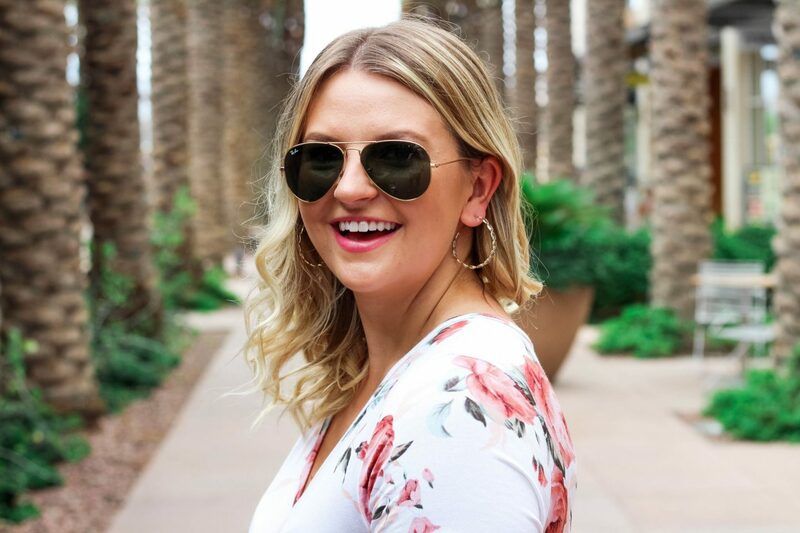 I love wearing bold hoops with summer dresses to add character to my outfit. 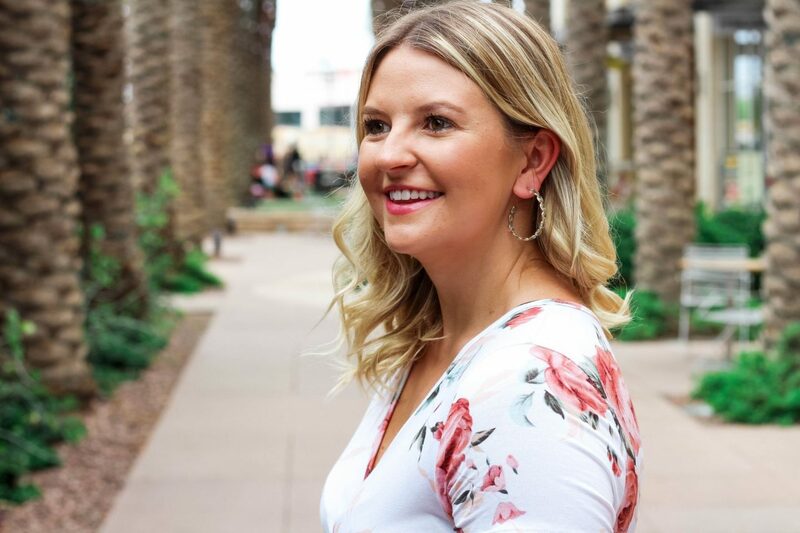 These earrings are also the perfect fall transition accessories and would look so cute with a blanket scarf and boots. 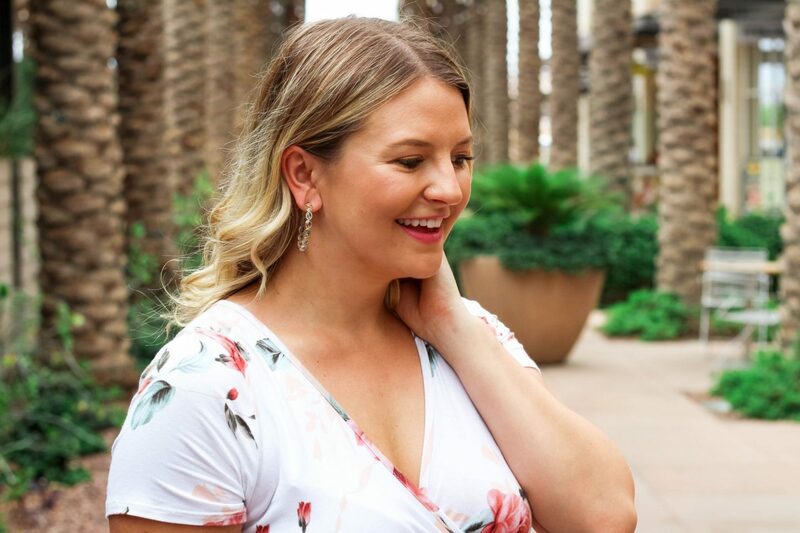 I also love these earrings because they can be paired with a simple top and jeans or can be paired with a dress for a night out. 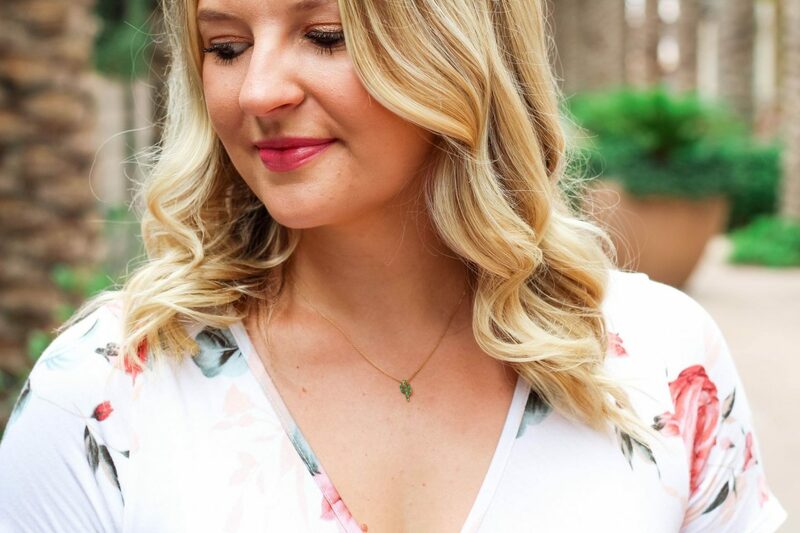 I love versatile jewelry that can be paired with various outfits, which is what I also look for when buying statement earrings. Last but not least, I wanted to share this beautiful necklace with all of you because it is so fun. Since I grew up in Arizona, I love cacti jewelry and it always reminds me of home. 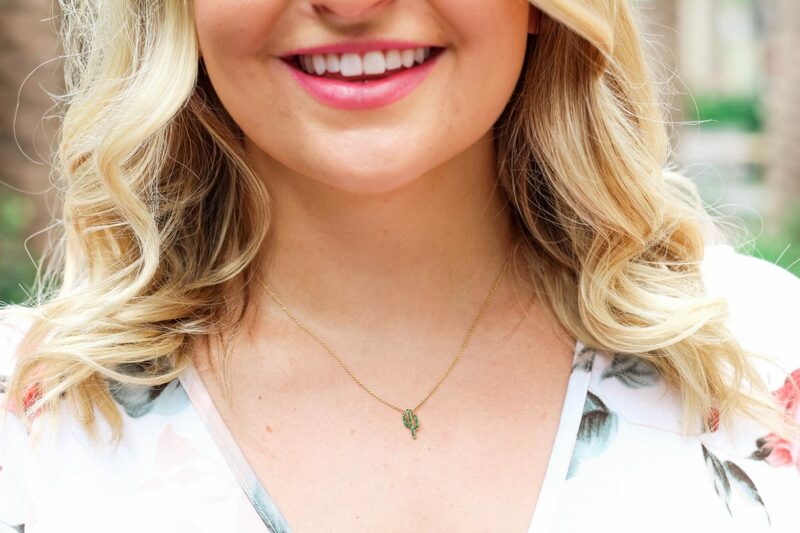 This necklace is simple, yet has so much character. 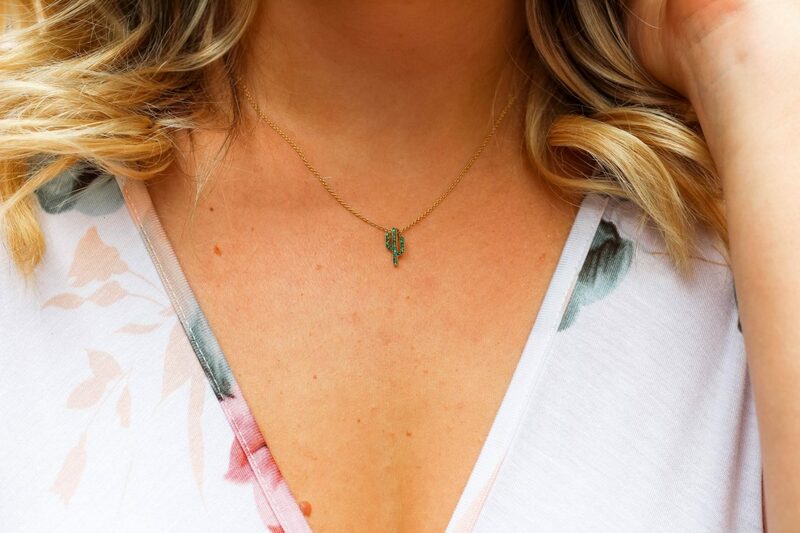 This cute little necklace is available at Galicia Jewelers in Scottsdale and is the perfect affordable necklace to add to your wardrobe. I love Galicia Jewelers because all of their jewelry is of the most exquisite quality. Even the most affordable pieces are still of the highest quality, which is something I look for when shopping for jewelry. 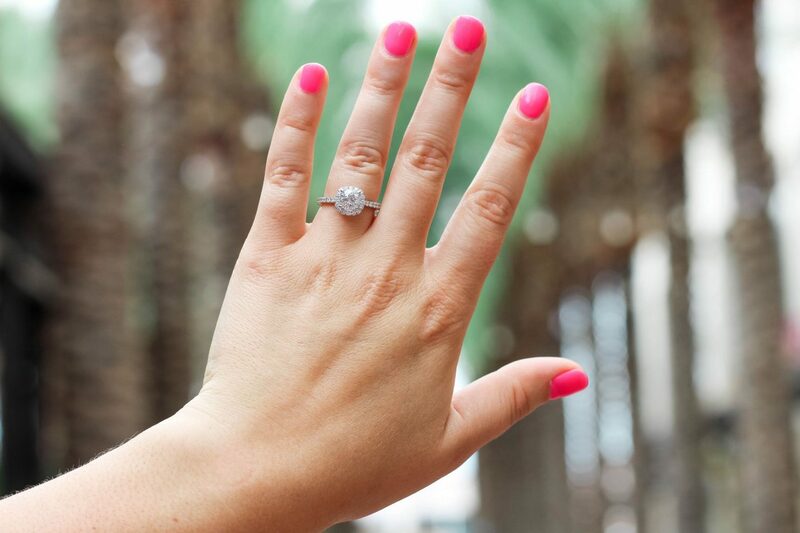 Also, if you go into the store and do not find something you absolutely love, you can customize your own jewelry with a highly qualified jeweler. 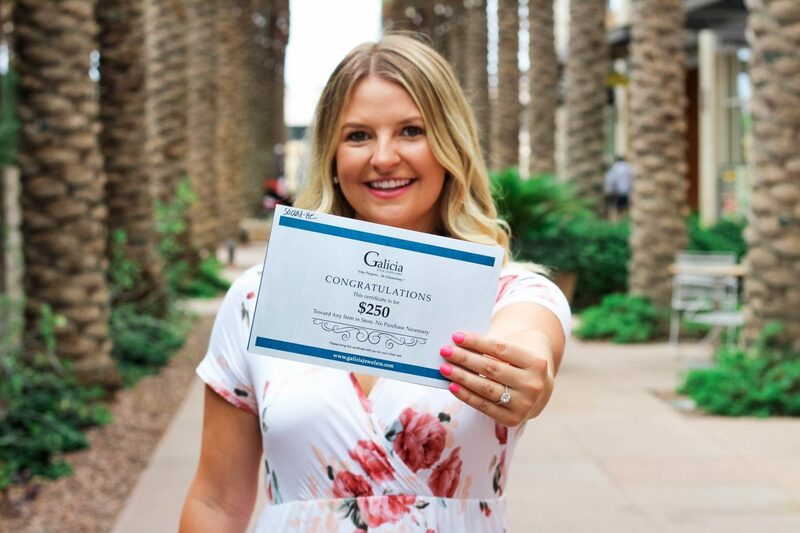 To top it all off, I am giving away a $250 gift card to Galicia Jewelers in Scottsdale! 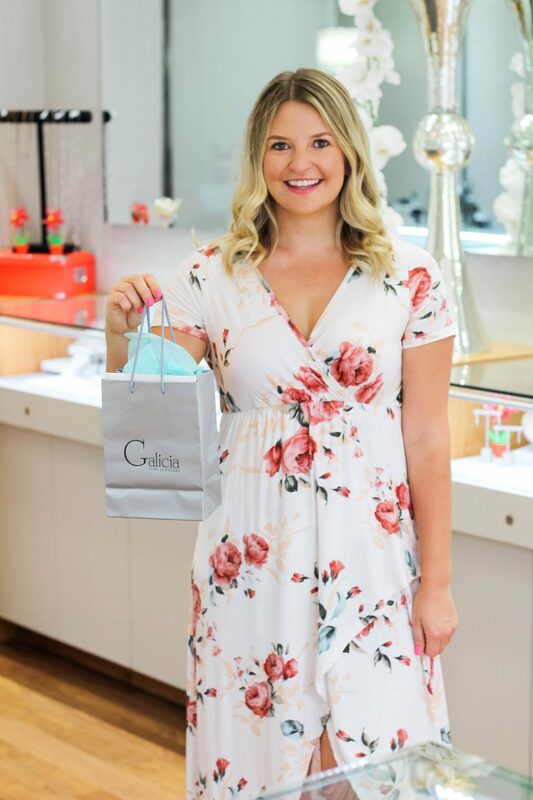 I love being able to give back to my loyal followers and Galicia Jewelers has been so gracious to host such an amazing giveaway! 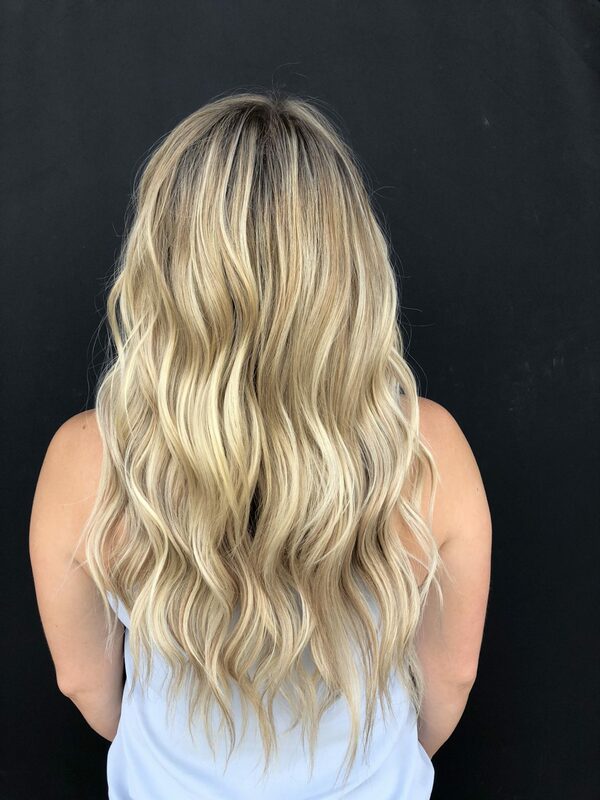 If you are interested in entering to win the $250 gift card, head over to my Instagram page @sandytoesandsaltyhairblog and follow the steps to enter. Good luck! 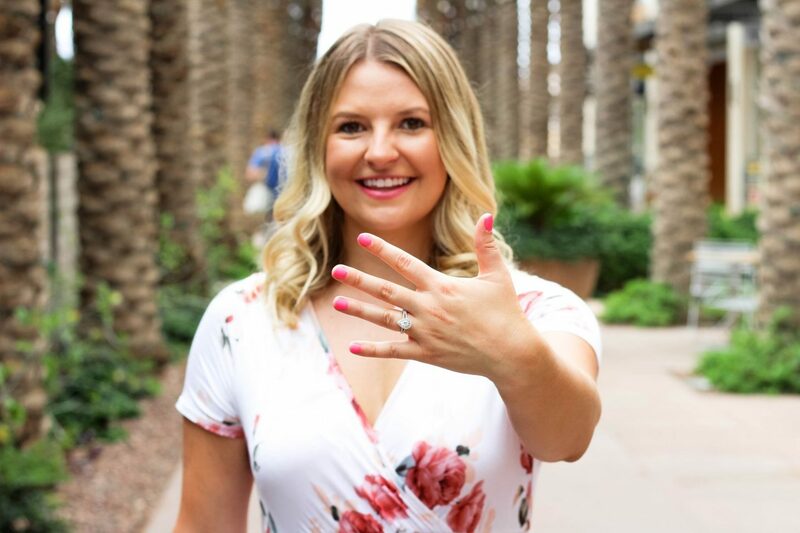 I hope you all enjoyed my favorite engagement rings from Galicia Jewelers and don’t forget to enter the giveaway on Instagram! I recently found this LED Face Mask on Amazon and have been absolutely loving it. 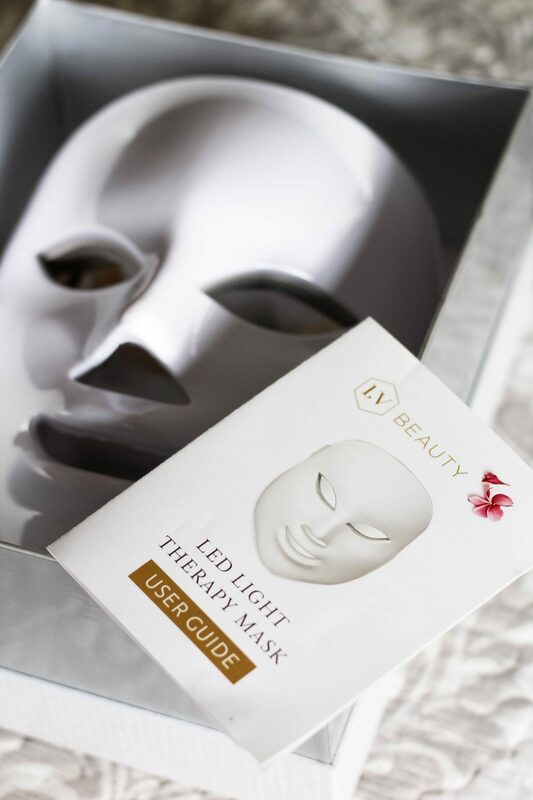 This face mask uses natural light waves from LED lights to enhance the skin. 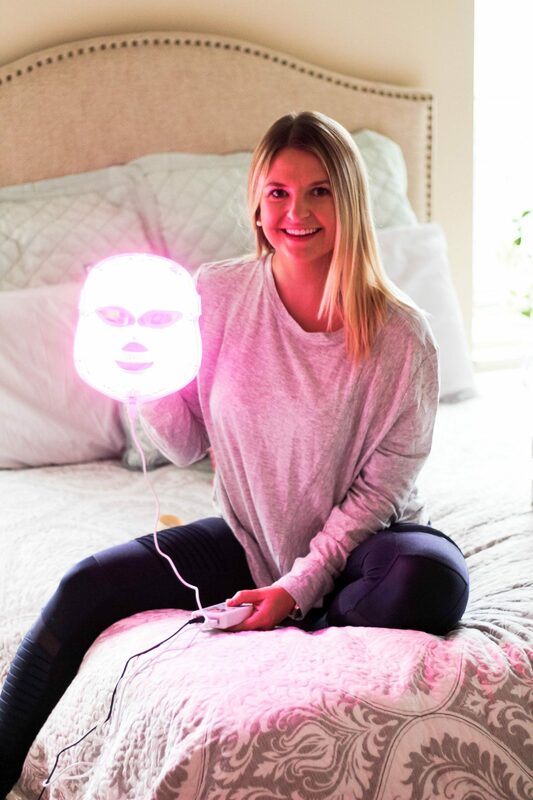 LED light therapy for the skin has been so popular lately, but can be very pricey. I had been so interested in trying it, but couldn’t find a mask in my price range, until finding this one. I saw how affordable this mask was and looked at all of the great reviews on Amazon before purchasing this LED Face Mask. I love how easy it is to use and how much of a difference it has made on my skin. I started incorporating this face mask into my daily skincare routine after having numerous breakouts on a regular basis due to hormones. It has helped decrease my acne and inflammation tremendously. 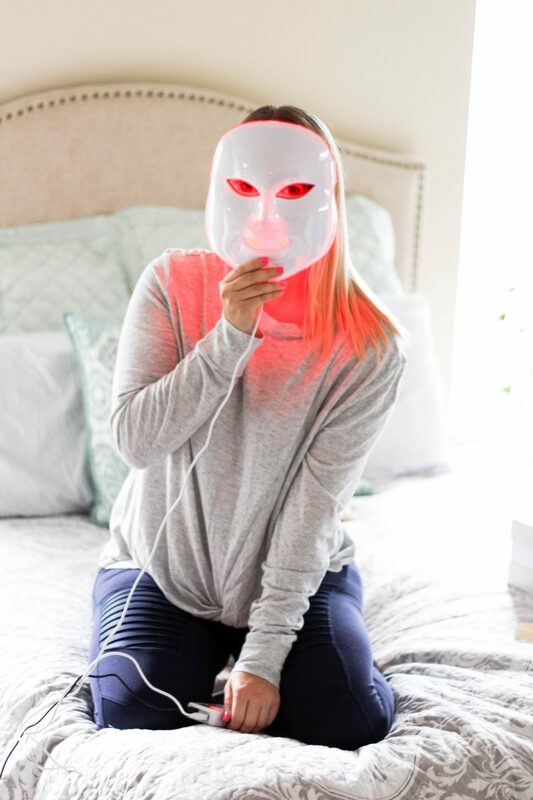 The LED Face Mask uses 7 different colors to enhance your skin. Increases cell activity, promotes cellular metabolism, helps the skin secrete collagen fibrous tissue, promotes blood flow, increases skin elasticity, and helps shrink/close pores. Inhibits inflammation, destroys acne causing agents to minimize acne and inflammation. Treats acne and fresh sores and contains repairing and restorative properties. Promotes anti-aging, relieves stress and pressure from the skin, and smooths winkles and fine lines. Fights inflammation and relieves pressure from the skin. Kick starts living tissue of metabolism and improves the appearance of fine lines and wrinkles. 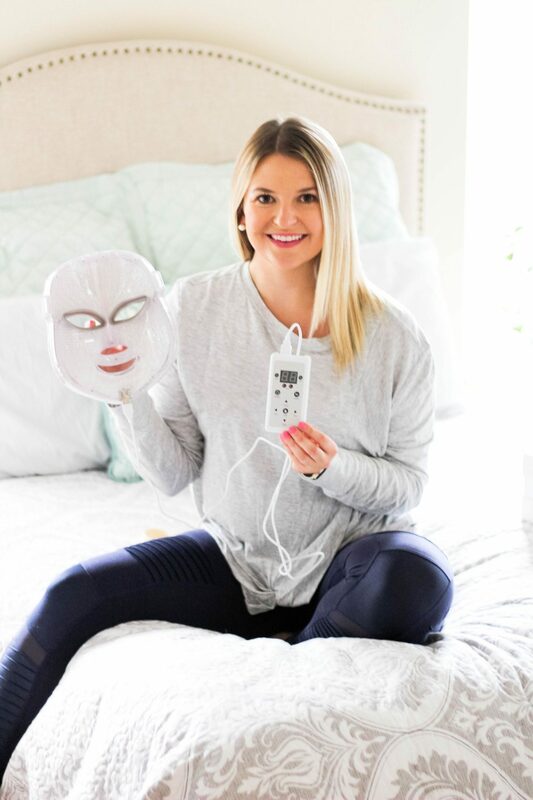 The mask comes with a remote to change the time (I usually do 15 minutes), intensity, and power the mask on and off. 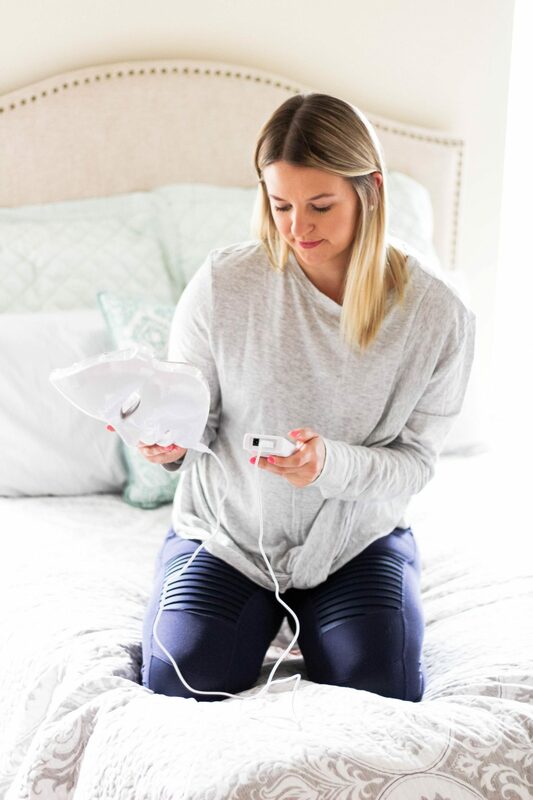 It also comes with a charging cord, which plugs into a traditional outlet and the mask plugs into the remote via a USB. 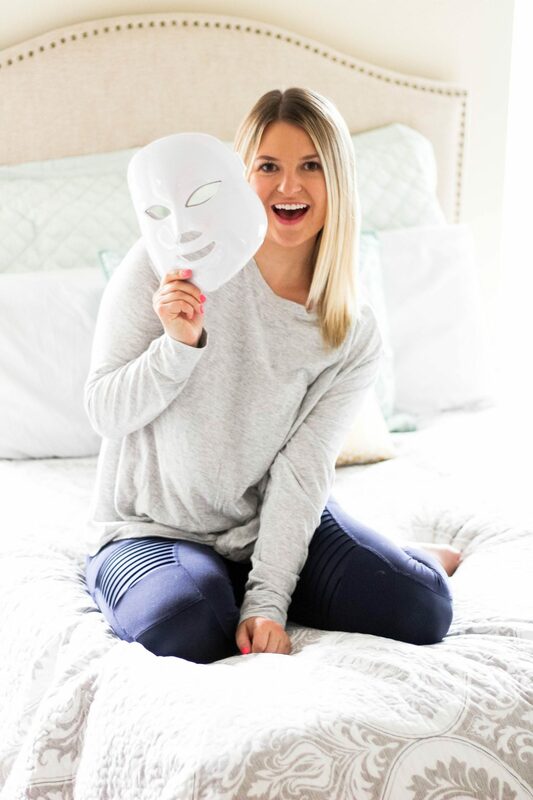 If you have been interested in LED light therapy for skin, I highly encourage you check out this mask!